It was the first warm day in northern Europe when I explored the historic German town Augsburg in April 2010. My lips were still chapped from the chilly March days in Berlin and Prague. The sun’s embrace thus felt so good. The locals agreed. 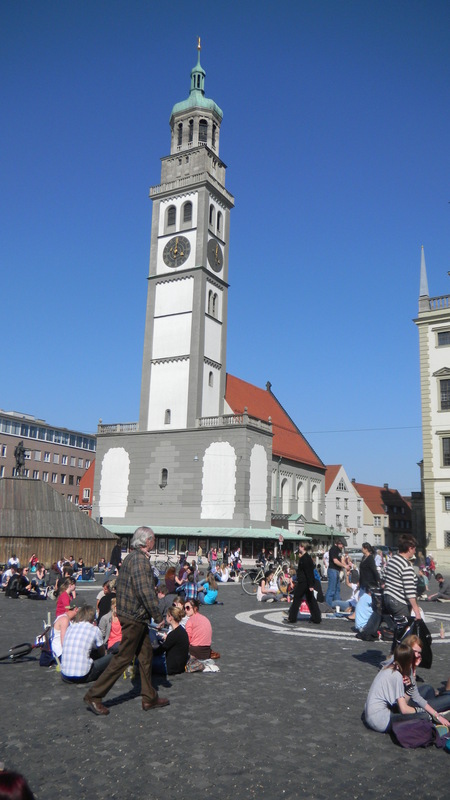 By late afternoon, the main platz was filled with people sitting in small groups, enjoying each other’s company in the midst of buildings from Augsburg’s long history. What a contrast with Cambodia’s rainy season, which I recently returned home from. In both land’s nature and culture converged in different ways which are fascinating. Spring in Europe and the monsoons in Southeast Asia symbolize the renewal of life. In northern Europe the sun returns from a long absence which makes chills bones and blankets fields with snow. Folks in the Middle Ages associated Jesus’ Resurrection with the sun’s coming. The south side of cathedrals symbolized the New Testament because the sun was returning from that direction. Ancient Celtic and Germanic lore about fertility was assimilated into Easter celebrations. What a nice association of ideas: Jesus as our savior, the warmth of the sun, the renewal of life, and good fun. In my travels I’ve found that many people in the Third World finid the West appealing. This optimistic view of life is one of the reasons. But the monsoon in Cambodia hits with a power that’s dramatic. The Khmer kings linked their prestige with this force and they sponsored art that stressed exuberance. It’s not always as benevolent as Jesus is. 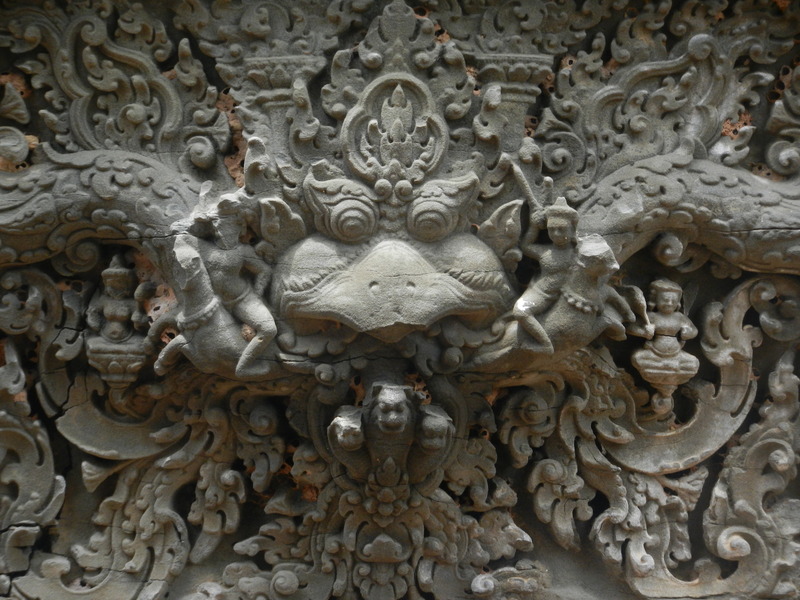 Here is the central part of a frieze over a door lintel in Preah Ko. This temple was built in the Khmer empire’s early stages, and it became a key model for art throughout Cambodian history, and it greatly influenced Thai art. It blends grace and terror. 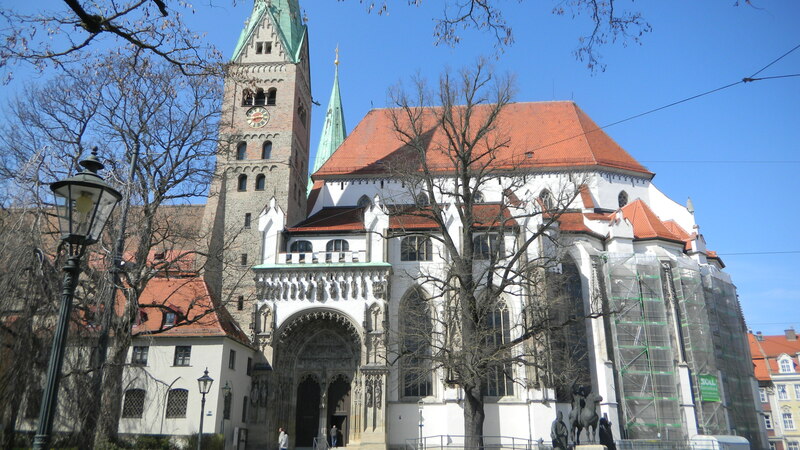 European cathedrals kept both apart–demons and angels were put in their separate places. 13th century Europeans thought in that way–the universe is a hierarchy of different beings, who were put in their own domains by God. 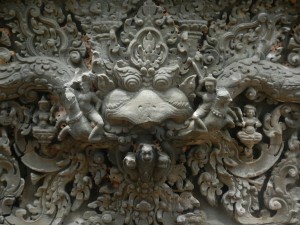 But this image from Cambodia shows all types of beings fused into an energy that’s irreducible. This view of reality is also rich. 1. It fuses a wealth of images and ideas in imaginative ways. 3. It reflects the larger-than-life forces of nature in tropical lands where the monsoons represent renewal. Both ways of seeing show the variety and richness of ways that nature and culture converge. I enjoy both equally.